So Martin wrote an ode to climbing. Since I haven’t done that much climbing lately and since I’m such a material girl, I’m instead going to write an ode to shoes…. Horrible right? 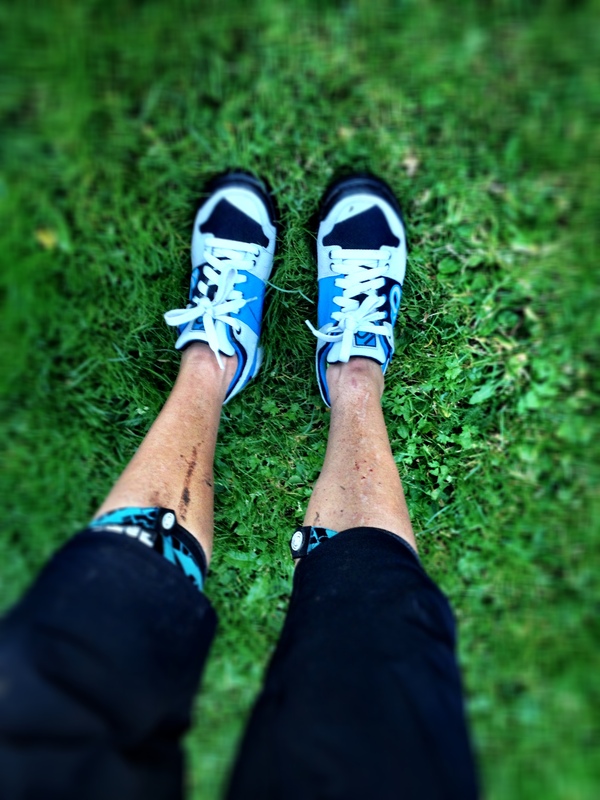 But really, as a mountain biker, especially one who likes to walk up a mountain before getting on the bike, the shoes on my feet – how they feel to walk in, how they grip on to rock and roots, and how they grip on to your pedals – is really not that trivial. My legs to the left. Summer 2011, still only slightly bruised. 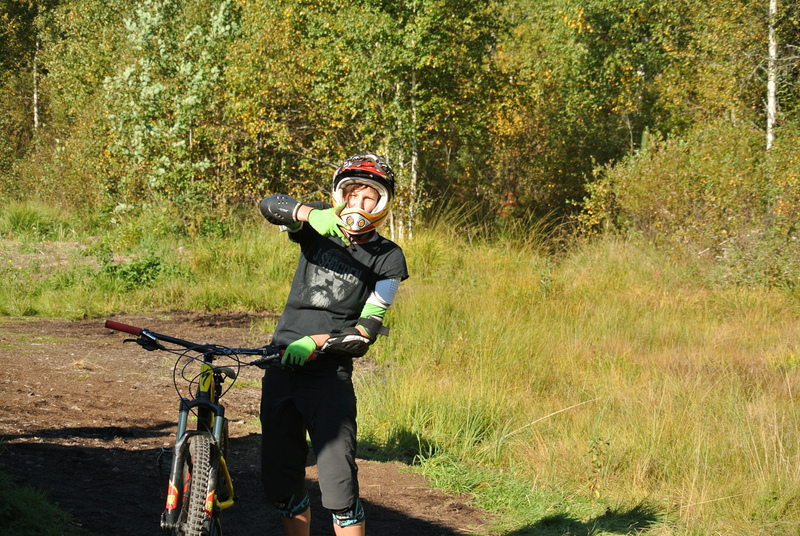 I quickly learned that the only way to ride was with Five Ten on your feet when I started riding with Martin. My first, was a pair of Guide Tennie. The Guide Tennie is not really a bike shoe (its an approach shoe), but the stealth rubber in the sole that makes it so excellent to walk up rock slabs in works just as well for getting your shoes glued to your pedals. The main downside of the Guide Tennie is that the sole is so soft, and that the inner sole is made of paper. That makes them particularly prone to falling into pieces during the looong and wet Swedish autumns. But how I lowed those shoes! I think I’ve had 3 pairs over the years. A second downside to the Guide tennies is that they perhaps aren’t the most beautiful thing you can put on your feet. To my eyes they look a bit like the skin of an obese lizard. Due to my super superficial nature, I couldn’t resist buying a pair of Spitfires when they were on sale. They were green, mocha, not at all my size, but very cute. I know a lot of people who really like the Spitfires, but they never worked for me. The rubber is just not as good as in the Guide Tennies. Thats why they still look pretty shiny in spite of being over a year old. 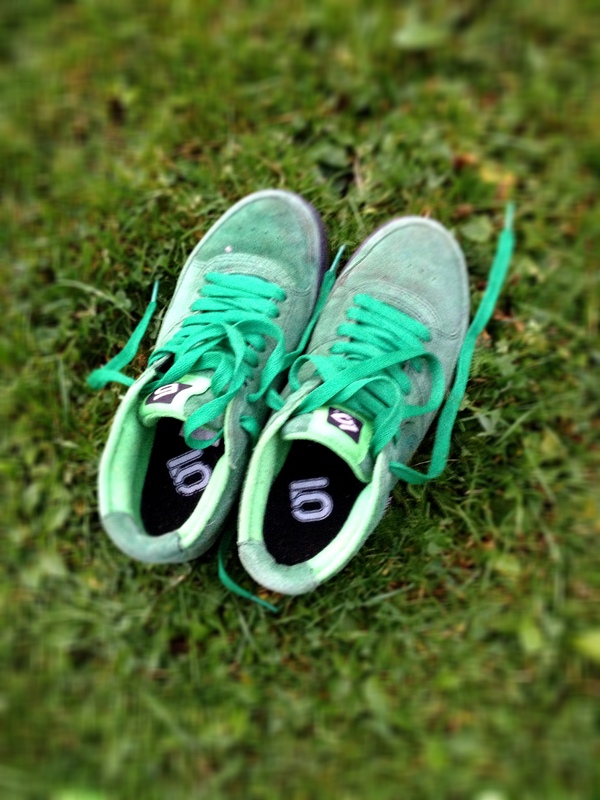 Then, finally, Five Ten came up with the brilliant idea of combining nice design with great rubber; the Five Ten VXI. I bought them in January and fell instantly in love. I just think they have it all – they look good on my feet, they stick to my pedals, but I can still shift position due to the slick part of the sole, and they work really well to walk up mountains in. Looking good and sticking like glue. 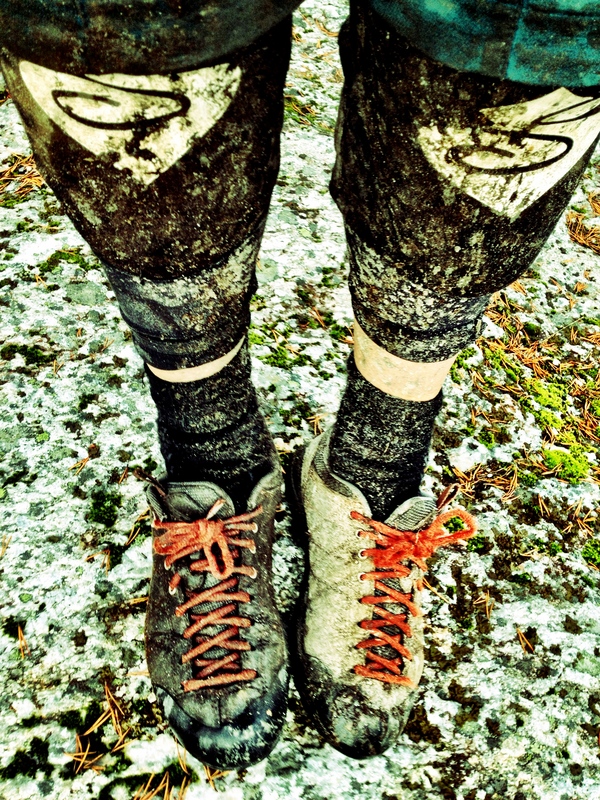 And no, its not pooh on my leg, just mud. 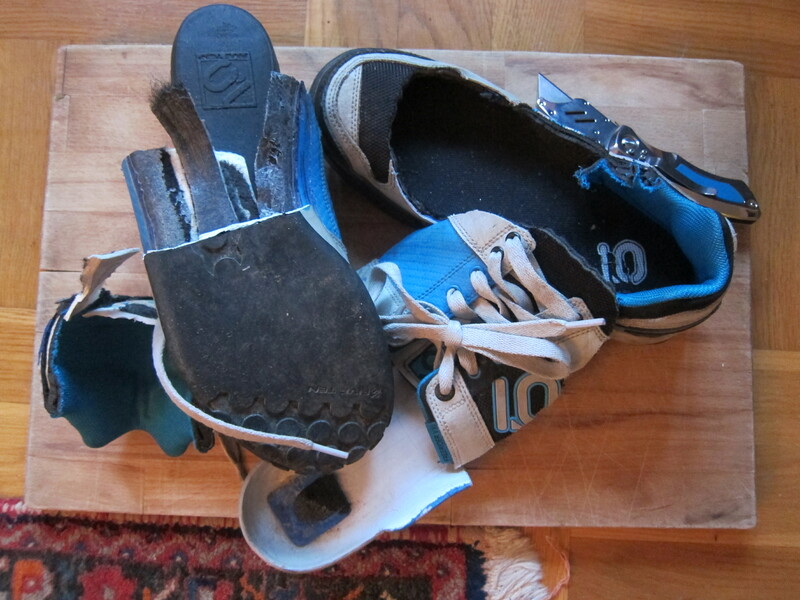 I was devastated when I, one day after a ride, tore off half the sole of the shoe as I was taking it off. 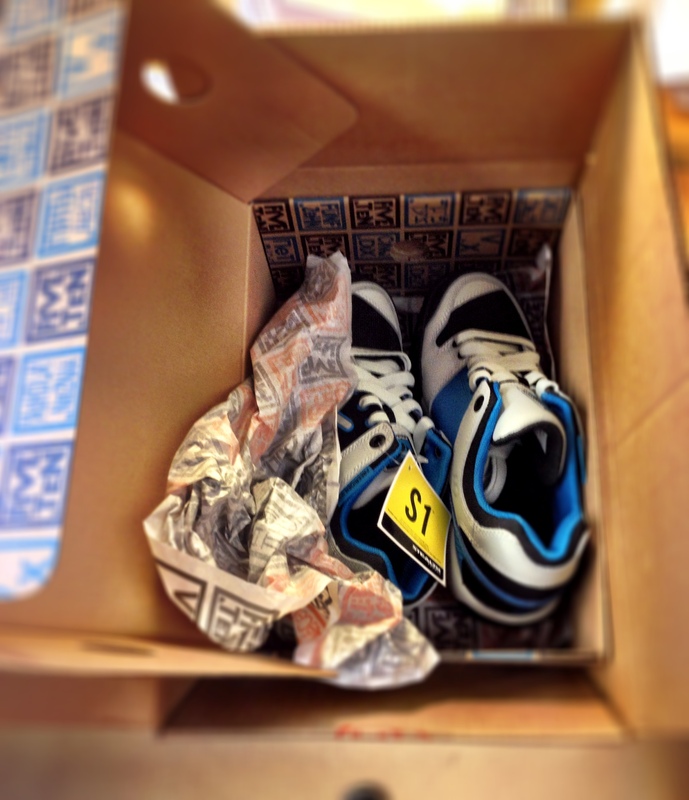 I was super nervous that Five Ten would change their mind and not send me a new pair (since I’m used to customer service in Europe, where you usually get nothing unless you have a super nice local store that can help you out), but just a few days later I got an “order dispatch”-email, and a week later a box of happiness was delivered to my door. Now I just have to work on my biking skills to do my new shoes some justice. My trail riding is working pretty well now, Bygdsiljum has really helped me get over my fear for speed and small drops, but I am HORRIBLE at jumping. Every time I approach a table jump, I tell my self “JUMP”, and then I squeeze my breaks until my knuckles turn white and role over. Shame on me. I have to get over it. Jump God damnit, JUMP! Ja! Hoppa! På söndag kommer du hoppa både högre och längre än någonsin tidigare. Tänk häst ; ) Tyvärr får jag ju inte vara med och leka, det var visst nåt jobb i vägen. Väldigt trevlig blogg förresten! Ha ha, ja jag borde onekligen börja lyssna lite mer på mina egna råd :). Kul att du gillar blöggen, men vad synd att du måste jobba på söndag! Vi får ta revanch en annan dag!